13 Interesting Facts about Friday the 13th - New Empire Group, Ltd.
Friday the 13th is considered the unluckiest day of the year. It is hard to pinpoint exactly when and where this fear originally began but we do know it has been around since the beginning of the 20th century. Here are a few interesting facts about Friday the 13th! The fear of Friday the 13th is called, “friggatriskaidekaphobia” – “Frigga” was the name of the Norse goddess for whom ‘Friday’ is named and “triskaidekaphobia” meaning the fear of the number 13 (also known as “paraskavedekatriaphobia”). A theory, recently proclaimed as historical fact in the novel, The Da Vinci Code, is that on Friday, Oct. 13, 1307, officers of King Philip IV of France raided hundreds of homes of the Knights Templar, imprisoning them on charges of illegal activities. Though the charges weren’t proven, more than a hundred died from terrible torture. For a month to have a Friday the 13th, the month must begin on a Sunday. It was on October 13, 1989 (a Friday) that the US stock exchange suffered one of its most major crashes. The day has since then gone down in history as ‘Black Friday’. The Alfred Hitchcock Connection – This genius filmmaker has made some of the best suspense films in the history of Hollywood — And it just so happens he was born on August 13, 1899, which was a Friday! In Spanish-speaking countries, instead of Friday, Tuesday the 13th, also called martes trece is considered a day of bad luck. In Italian pop-culture, Friday the 17th is considered a day of bad luck. Pagans actually find 13 a lucky number because it parallels the number of full moons in a year. 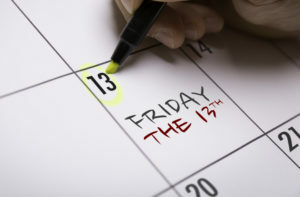 According to findings from the Stress Management Center and Phobia Institute in North Carolina, it is estimated that 17 to 21 million people in the US are affected by the fear of Friday the 13th (making it the most feared day in history). According to the British Medical Journal there is a significant increase in traffic-related accidents when the date is Friday the 13th. We hope you found these facts interesting! Happy Friday! Be sure to check out the great Insurance Programs for Condominium Insurance,Cooperative Insurance, Apartment Insurance and Property Manager’s Insurance that New Empire Group, Ltd. offers! Find us on Facebook, LinkedIn & Twitter!